Colorado's Black Canyon, one of the nation's newest National Parks, is steeper and narrower than the Grand Canyon. There are many spots where the Gunnison River that runs through the canyon is exposed to the sun for only a few hours each day and dangerous rapids often fill the entire space between the stark canyon walls. After his first visit to the Canyon, Robb Magley knew he wanted to write about this unbelivable place. During the research for what he thought was going to be a magazine article, the author learned about William Torrence and Abraham Lincoln Fellows who in 1901 completed the first full passage of the Black Canyon using rubber boats for portions of the trip. After reading their accounts of the trip the author made up his mind that he needed to make an attempt at following Torrence and Fellows into the Canyon. 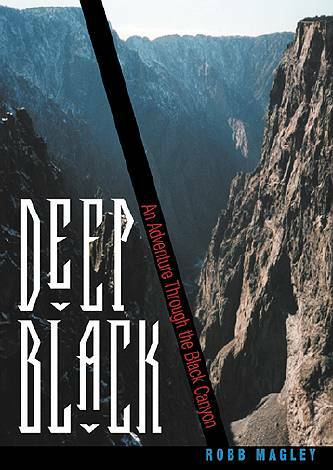 Deep Black, therefore, not only tells the history of the various attempts at exploring the Black Canyon but also chronicles Robb Magley's own adventure of traveling on foot with a friend through thirty-three miles of narrow, dangerous canyon. The adventure required seventy-six river crossings with no boat and almost cost them their lives. As Robb puts it, "We had no food and no way to purify drinking water. The sun was going down, and we had nothing but shorts, T-shirts, and life jackets to keep us warm. The only piece of gear either of us had left was our river knives, clipped to our life vests in the event that we had to free ourselves from a fouled rope. The canyon was getting darker, and we had run out of options." Robb Magley has written articles for several well-known magazines such as Adventure Journal, Western Style, Montrose Style, and Telluride Style. This is his first book.